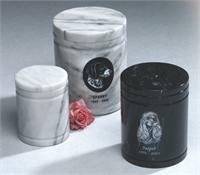 Black or white princess marble, with delicate veining patterns that will vary on every piece. Shown with optional* engraving of name and dates (available in Script or Block lettering only), and optional* breed-specific artwork. Artwork on the white urn is reversed in a black circle and artwork on the black urn is filled in white. Dog breeds available are: Basset Hound, Beagle, Boxer, Bulldog, Bull Terrier, Collie, Cocker Spaniel, Dachshund, Dalmation, Doberman, German Shepherd, German Shorthair, Golden Retriever, Great Dane, Labrador (Black), Labrador (Yellow), Poodle, Pug, Rottweiler, Schnauzer, Shih Tzu, Siberian Husky, Springer Spaniel and Yorkie. Please see bottom of page and click on more info to see breed specific artwork in greater detail. Would you like to add breed specific artwork? Would you like your pet's name and dates inscribed? Which type style do you prefer for personalization?